Stuga Autocut-AS automatic ancillaries sawing centre, refurbished including painting where required. This fully refurbished machine will include printer, offcut conveyor and dust extractor. The drives, control system and software will be the latest versions. The machine is designed to saw at 45 or 90 degrees for cills and all suitable ancillaries subject to technical acceptance. 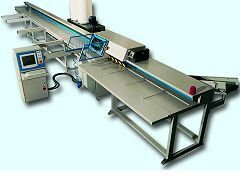 This a fast easy and accurate way to produce cills in volume and these machines are used by a number of large fabricators. Price will include profile programming for the Stuga software, delivery, installation, training and 12 months parts and labour warranty (mainland UK).